Learn how to use wage types in SAP ERP HCM Personnel Administration and Payroll for storing elements involved in the payroll process. Find out how pay structures are used to group employees into salary and pay-related groups, and why SAP ERP HCM provides a central maintenance transaction for employees to manage master data. In this section, learn how wage types are used in SAP ERP HCM Personnel Administration and Payroll for storing elements of payments and deductions in the payroll process. Find out how pay structures are used to group employees into salary- and pay-related groups, and how to manage master data through the central maintenance transaction in SAP ERP HCM. Wage types are used in Personnel Administration and Payroll for storing the amounts, rates, and time units of payments and deductions that are subsequently used in payroll processing to calculate an employee's pay. Wage types are primarily stored as components of an employees' pay in Infotype 0008 (Basic Pay), or as a one-time or recurring payment and deduction on either Infotype 0014 (Recurring Payments/Deductions) or Infotype 0015 (Additional Payments and Deductions). Figure 2.6 shows a payment wage type assigned to an employee. In addition to wage types, SAP ERP HCM also uses an element known as pay structures. Pay structures are used to define and group employees into their salary-and pay-related groups. They are especially useful for managing complex groupings of employees in highly structured work environments, where industrial-relations-related employee groupings and definitions are required, and also for employee populations where salary bands or grades are utilized. There are two basic types of pay structures that can be defined in SAP Employee Administration: Pay Scales and Pay Grades. Pay scale structures are typically defined for hourly or wage employees and those working under collective bargaining agreements. Pay grade structures are typically defined for salaried or non-wage employees. Pay structures are used to group employees into regional, legal, financial, or industry groups and are then used to manage the salary or pay rates within those groups. Pay scales commonly define specific rates of pay, including steps or levels of pay. They can be set to be overwritten or, if required, to be read-only, allowing no deviations from standard or pre-defined wage rates. In addition, pay grades can be used for salaried employees, where pay is typically not as rigidly defined. Salary bands, grades, and ranges can be defined which allow management ranges within the bands, and enhanced reporting and analysis of salaries within the company. Within Employee Administration, standard programs are provided to automatically update pay scales and pay structures, as well as employee data, so that changes in employment agreements and company pay policies can be quickly reflected. The pay scale hierarchy is shown in Table 2.8. The pay grade hierarchy is shown in Table 2.8.1. The accurate recording and management of employee working time is one of the key aims of any SAP ERP HCM system. SAP ERP HCM uses work schedules to record your employees' planned or contracted working times. A work schedule allows you to view an employee's planned working time for any day, including planned start time (or range of start times), breaks (morning, lunch, afternoon, or as required), and planned finishing time. You can quickly see an employee's planned working hours for a specific week, month, or year. Defining and mapping employees to the correct work schedule is immensely important to companies that operate in complex factory, manufacturing, or other labor environments. Knowing when employees should be at work, on a break, or not at work gives shift managers, roster supervisors, and time sheet administrators valuable information to manage employee working times effectively. Companies that have mainly salaried staff working normal office hours are generally not as concerned about recording and tracking their employees working time. However, work schedules are still important to these types of companies so they can effectively manage vacations, sick leave, and other absence- and attendance-related activities. Work schedules are made up of the following components (Table 2.9). Figure 2.7 shows an employee's work schedule details. Work schedules are also the main source of information in the SAP HCM Time and Attendance functionality, and are discussed in more depth in Chapter 7. Now that we have reviewed what we can store in Employee Administration and how this information is stored, we need to look at what we do with the data. One of the main purposes of Employee Administration is to streamline and automate the basic processes related to personnel and employee information management. SAP ERP HCM does this by providing tools that support the core tasks related to Employee Administration, including master data maintenance. SAP ERP HCM provides a central employee maintenance transaction that can be used across many of the components to create, display, edit, copy, and delete master data. 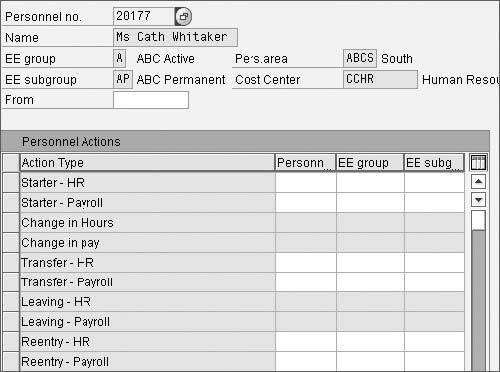 The maintenance transaction (called Maintain HR Master Data) allows you to quickly view all of an employee's data, including employee history, in an overview or detail mode. As we discussed earlier, all employee master data is stored in infotypes. Each infotype is defined with a time constraint that applies a specific validity rule to the infotype. An example of these rules is a time constraint that determines if an infotype record must always exist for an employee while he is active at the company. Time constraints also determine if an infotype can exist multiple times for the same period for an employee and whether the infotype can have overlapping records, or if records must be sequential with no time gaps in between records. Master data entry is further enhanced by the provision of the object manager. This tool appears on the side of the data maintenance screen and allows you to select groups of employees via a search tool. You can then switch quickly between them as you perform your data maintenance. In addition, commonly used employee searches can be stored for quick access, further speeding up data maintenance. 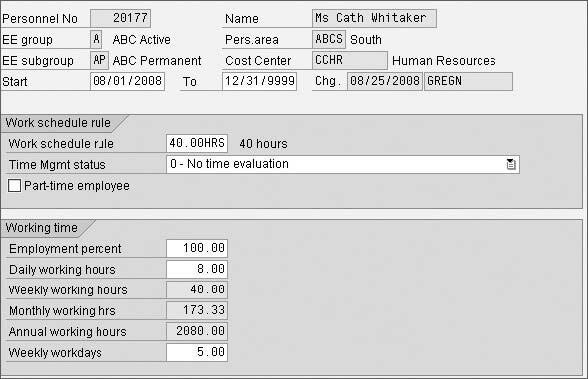 Another feature is the personnel file function, which allows you to scroll through an employee's virtual file and displays all of an employee's infotype records in chronological order. When significant employee lifecycle changes such as hiring, promotions, or transfers take place, in order to record all of the details of the changes, HR administrators often have to maintain multiple infotypes. Personnel actions are used to control the editing of multiple infotype records. SAP ERP HCM uses a system called personnel actions to link together strings of infotypes so that they can be performed sequentially. Personnel actions are used to speed up common processes such as hiring employees, performing organizational reassignments, and processing terminations. Each personnel action contains all of the infotypes required for that specific action, allowing the user to proceed sequentially through the screens for inputting all of the required information. Different versions of the same action can be defined for different types of employees and for different countries, which allows you to tailor them to specific requirements and speed up data entry tasks. Figure 2.8 shows an example of a set of commonly used actions for a company. This tool is designed to speed up the process of bulk data entry. It allows you to process infotype updates for multiple employees simultaneously. Employees can be selected dynamically using a set of reporting tools to select only the employees you require, based on your own search criteria. In fast entry only the fields that you require for input are displayed, depending on the infotype you have selected. This tool provides valuable time savings when you need to process bulk employee updates such as bonus payments, increases in recurring allowances, or the termination of a specific payment to a range of employees. Recognizing that any HR system is only as good as the information that can be retrieved from the system, over 200 reports are delivered as standard. For ultimate flexibility, two standard reporting tools are delivered that allow users to create their own reports. These tools are InfoSet Query and SAP Query. The two tools offer differing levels of complexity and power, allowing users to work with a simple click and drag report producer or a more complex reporting tool with more input and output options. All of the data stored in the Employee Administration infotypes is also available for reporting from external reporting tools such as SAP Business Intelligence (BI) without having to spend time on programming. More information on SAP ERP HCM's reporting capabilities can be found in Chapter 8. As a standard function defined during system implementation, master data entry can be automatically checked as it is entered to ensure it is correct and valid. Any changes to employee-related data are stored in the audit log clusters to ensure that all activities can be tracked and traced. The level of audit tracking is able to be defined by the company during system implementation. Single fields or entire infotypes can be set to have changes logged. This flexibility allows audit reporting to focus on key pieces of information and ignore non-essential data changes. A similar report is available for reporting on changes to Personnel Development infotypes. With most large SAP ERP HCM systems, the question eventually becomes not if you are going to archive your data but when. Most multinational SAP ERP HCM systems reach a point where the databases are getting too large, or a large portion of the data is obsolete for day–today requirements, but the data is still required for long-term access requirements and legal reporting purposes. Large volumes of data slow down system response times and make the system inefficient -- not to mention frustrating. Data archiving is facilitated in SAP ERP HCM using SAP NetWeaver technology. The process for archiving in the SAP ERP HCM components is consistent with the process used in other parts of SAP ERP. The SAP ERP archiving process allows you to determine a proactive archiving and retrieval process so you can balance system response against reporting requirements to ensure you get the best of both worlds. Authorization and security controls within SAP ERP are an area of specialty all on their own. The ability to view, edit, or delete employee data is a critical component of any SAP ERP HCM system, so it's good to know that SAP ERP's authorization control for SAP ERP HCM is built around the standard logic used across all SAP ERP components. Authorizations and accesses can be controlled at an employee, infotype, wage type, personnel area, subarea, employee group, employee subgroup, or organizational level, providing significant flexibility in maintaining control of your employee data. Authorizations can be built around role authorizations, where the authorizations for a user are dependent on the user's job, and via structural authorizations, where the authorizations are assigned depending on where the employee works in the company. In addition to the ability to control access to employee data, SAP ERP HCM also gives you the ability to control your users' access to transactions and reports, allowing you to create authorizations that meet the specific requirements of your company. Employees can be authorized to run payroll, but only in test mode; they can be allowed to access their own data, but only in display mode, or in maintain mode for some infotypes and display for others. SAP ERP HCM also contains a tool called the Profile Generator, which allows you to maintain authorizations for people who have different job roles and perform the same functions for the same position but in different company areas. This gives you the ability to create custom authorizations where required and the ability to reuse the same authorizations across the company. As mentioned earlier, Employee Administration is the core of the SAP ERP HCM product. Employee Administration is fully integrated with all of the other SAP ERP HCM components, either directly through the data stored in PA infotypes or via links and relationships between this data and data stored in PD infotypes or even other SAP application areas, such as cost centers (which are stored in Finance/Controlling). This means that, for example, changes to an employee's cost center are picked up instantly by payroll, and a change to an employee's marital status will have an instant impact on which employee benefits he is entitled to in the Benefits function. Employee Administration draws finance information, such as cost centers and company codes, straight from the SAP ERP Financials component; therefore, any creations or changes to a cost center done there will be instantly visible in Employee Administration. The seamless integration capability of SAP ERP HCM has always been one of its main benefits. So let's take a look at a British satellite company to see Employee Administration at work.